Years ago, this photo was lost in a move. I searched for a replacement for quite a while, and finally found one. The photo is of the Salt Lake City Temple spires, with fog all around. 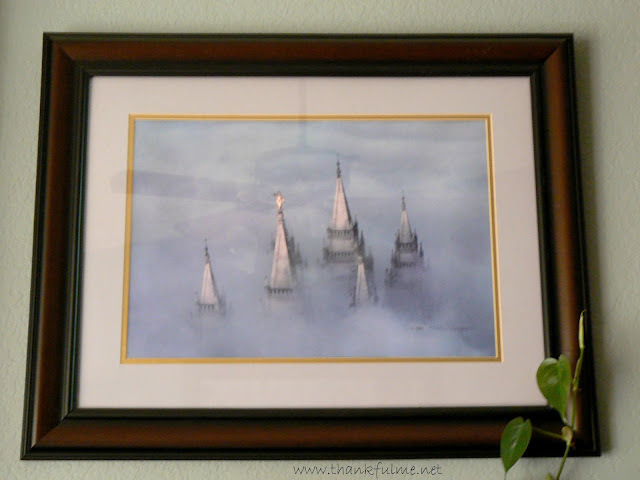 I like the visual representation of the gospel shining forth out of the mists of the world. The gospel of Jesus Christ gives me hope, even when events in the world are confusing, angry, or sad. When I was in 3rd grade, my teacher gave me (and everyone in the class who wanted one) a start from Colonel Coleus, the classroom plant. Though my mom always had houseplants, that was the first time I had my own. Colonel Coleus' kin has long since passed, but I've had houseplants ever since that time. This Christmas cactus reminds me of my grandma, who had several huge Christmas cacti growing in her house. 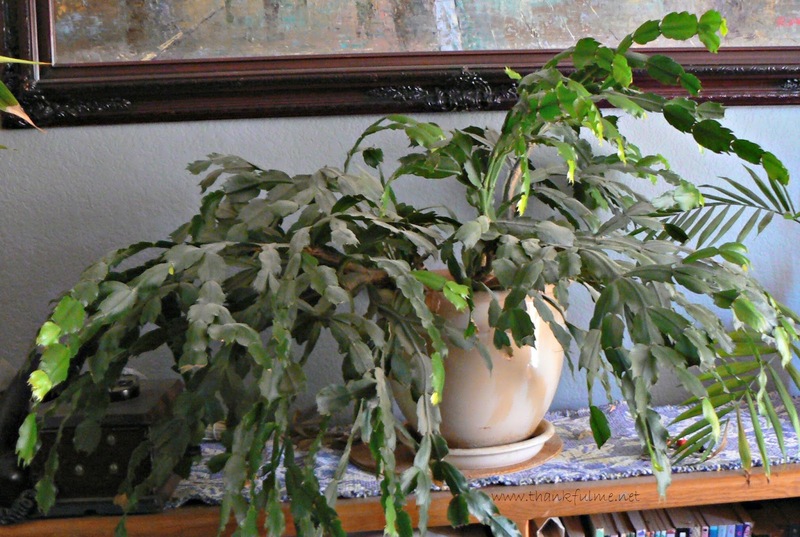 Even the care center where she now lives has an enormous Christmas cactus. Another houseplant, but I'm counting this as a separate entry. 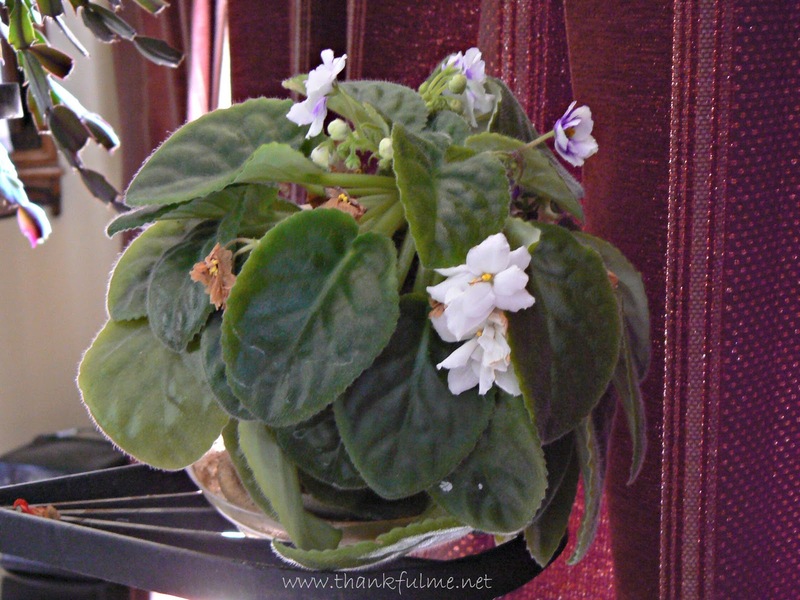 This is one of the African violets that told me when my other grandma died. It has been in an almost constant state of bloom ever since, and I think of her every time I see it. Both of my grandmas enjoyed crocheting, and this is just one example of their handiwork. It reminds me of all the time they spent in loving service for their family. Youngest daughter made this when she was a little girl, and it represents to me our commitment to a strong family. 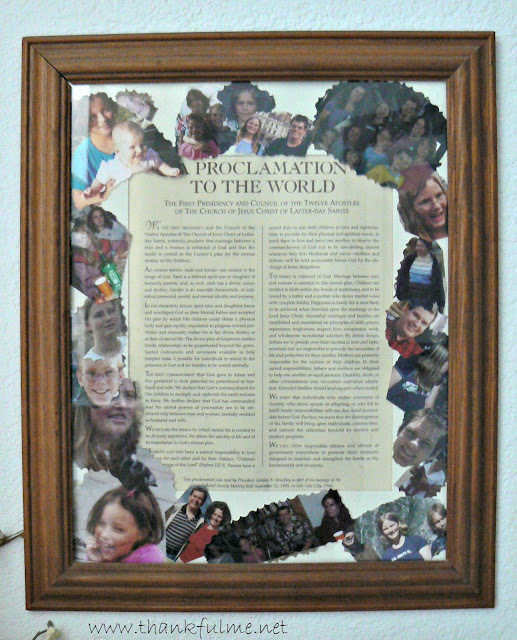 The document is The Family: A Proclamation to the World , and the photos are of our immediate and extended family enjoying time together. Music has always been part of our family, and every Monday night we gather around the piano, as songs and prayers open and close our Family Home Evening. This little tied quilt reminds me of the time years ago when John and I went on a pioneer trek (items 5-7 on that link). The quilt was tied by our trek kids, and serves as a memento of those days and all the lessons we learned about the dedication of the early pioneers. The framed photo of that woman is another item of significance to me. I know I have a lot of links in this post, but if you haven't read about how I found her photo, please go read the story here. It's truly one of the most amazing things I've experienced. Rather strange that two antique store finds make my list, but I am amazed at what shows up in random places. 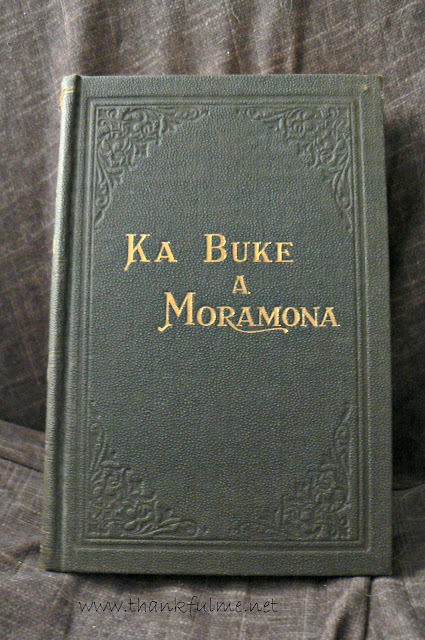 This is a 1905 copy of The Book of Mormon, printed in Hawaiian, that I discovered in an antique store in a tiny western Washington town. I have no idea how it got there. I don't read Hawaiian, but I do love old books, and scripture is scripture no matter the language. This little car reminds me of John, and I'm so glad it (the car) is sitting in the garage, and that John is part of my life. You can read about John's original Anglia here, and this little red beauty here. Hi Kristi, frist, I guess. It was so nice seeing you in the Google Hangout today. Your post speaks volumes about the love of family, which is a large item of gratitude in my life as well. You have some priceless handiwork treasures! I loved what you decided to put in this post, AND I am really excited about being tagged! I think this will be really fun. Can't wait to see what you put on your list! wow some of the things on your list are so special... that book! That family collage and your grandmothers crochet work! How wonderful! I cant wait to see your mom's choices! Of the things I treasure in my own home, hand crafted family mementos are always top of the list and you have some lovely ones. It's nice when items have special meaning, isn't it? John has a fabulous car! I need to read up about it! And now I have seen that temple in person. That crochet work is SO IMPRESSIVE! I have some crocheted heirlooms as well. It's a little Anglia--an English Ford, though his is a left-hand drive--the "Harry Potter car." The temple is more impressive in person, isn't it? The doily in #8 is also my grandma's work. 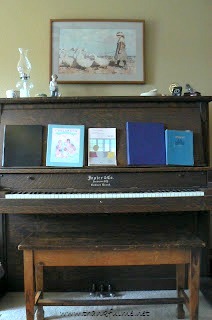 I'm especially interested in the piano, and the beautiful work that your grandmother crocheted. The piano is 100 years old (or is it 101 now?) It still plays well, considering its age. 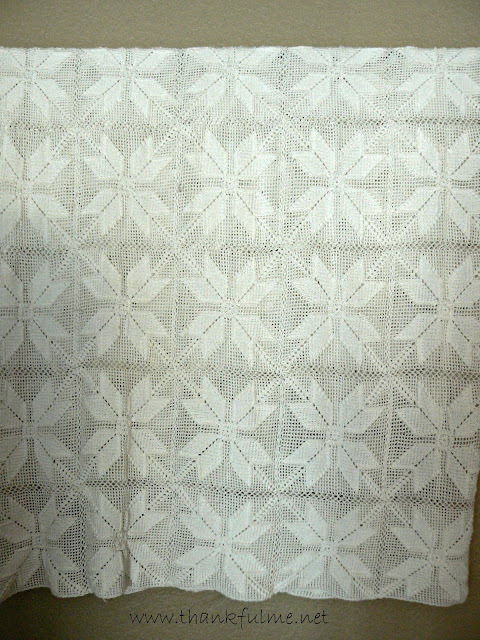 The crocheted project is a bedspread. One square never got completed. I suppose I could find a pattern somewhere and try to finish it. Maybe someday. I love the old book. What an incredible find. It's fascinating to think who might have held it and read it, and where it's travelled in its existance. Exactly. Old books are fascinating that way! The Grandma Whitehead story is AMAZING! I'm so glad you went back and bought that photograph! 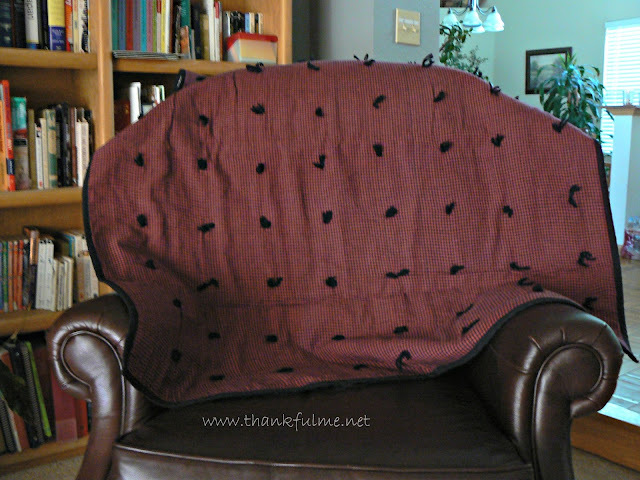 Love the crocheted blanket. I love to crochet, although I never do it. That's a lot of intricate work. The family collage is very sweet. I KNOW WE'RE RELATED, BECAUSE I HAVE THE GIRL WITH THE GEESE PAINTING IN MY FAMILY ROOM!!! Isn't that story incredible? I'm so glad I bought it, too. And since we are related, geese or no, I guess that means you are related to Grandma Whitehead, too! The collage was a Christmas present years ago, and I think it's sweet, too. So many family treasures! Heritage is so important, my Grandma would spend hours telling us stories about who came out and why and what happened to them. When she passed, her cousin took me on a drive around the little town pointing out houses to all the stories I'd heard. The whole thing is full of loveliness. I love your appreciation for those mementos that carry so many stories and life lessons. I recently took photos of everything in my parent's house that had significance to me or made me smile--they seem to collect a lot of things that need TLC. It used to drive me up the wall, all that stuff, but now I see it all as treasures. Thanks for sharing. The photo caught my eye the first time I saw it. There are lots of different photos of temples, especially the Salt Lake Temple, but this one is unique. I hadn't really considered the way the leaves appear on the Christmas cactus, but you're right--it is pretty cool. Thanks for sharing and I will visit your mom's blog too. It would be fun to read your list! I really am enjoying these lists that include such intimate peeks inside my virtual buddies' worlds. That crocheted piece is a real treasure, and I too am moved by the photo of the spires. It was fun to look around my house and think, "What should I include?" Your favorites are wonderful! My husband would love that car! We had a red Mini Cooper, and he always has wanted an old MG or Triumph. Mini Coopers are definitely cute! What wonderful favorites and I love that John is in the last picture as he always is!